2018 was a tough year for markets. UK equities (measured by the FTSE All-Share index) fell by -9.5% (see Chart 1). However, this index is dominated by global multinational companies such as HSBC, Shell and GlaxoSmithKline. The more UK focussed FTSE 250 Index fell by -17.6%. Part of this is of course Brexit related (of which more below) but also reflected a slowing global economy. China’s domestic Shanghai index fell by -22.7% reflecting slowing growth there and Germany’s more international, industrial focussed DAX index fell by -18.3%. and particularly in December, all this changed and it was the US that led markets lower. December was in fact an historically bad month, the second worst on record with the worst being in 1931 – the beginning of the great Depression. To put this into context, it is easy to be alarmed by the current laundry list of market worries – a global slowdown, Trump and his trade wars and Brexit – but this December was worse for US equity markets than any December in World War II for example, including December 1941 when the Japanese bombed Pearl Harbour. The global outlook got a little worse in December, there was no Pearl Harbour. If the year-end timing of the sell-off was very unusual, a market fall of 15%-20% is not. One reason that equities are the highest returning investment class is precisely because they go up and down regularly and (mostly) unpredictably. If it was easy, returns would be lower! The other point to make is that as any market falls, the expected future returns (normally) go up. For some of the markets that under-performed most last year (including emerging markets and UK domestic companies) these valuations now look very attractive to our eyes. 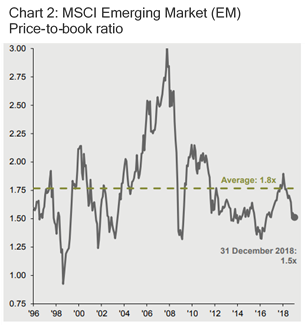 To illustrate this, Charts 2 and 3 below show that at the current price-to-book for emerging markets your expected 10 year annualised future returns from this starting level (using data from 1996 onwards) range between 8% and 16%. We argued in our last overview that looking bottom up, at the current returns on equity being earned today by emerging market companies, a high single digit return looks very achievable. If the current gloom passes and emerging market equities re-rate higher then we should get to the higher end of the range with double digit 10 year annualised returns. To put this into context a 7% p.a. 10 year return will double your money. This is the prize we have our eyes on as we continue to ride the inevitable ups and downs on emerging market investing. We can also now add UK plc to the list of unloved, unfashionable opportunities. By this we mean UK focussed medium-sized companies rather than the more internationally focussed large cap FTSE 100 Index. These mid-cap companies fell almost 20% from already reasonable starting valuations in 2018. Part of this of course relates to concerns over the outcome of Brexit. 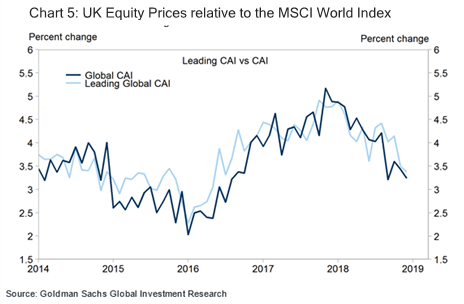 Not since the dot com bubble and prior to that the 1980’s have UK equities traded as cheaply vs the rest of the world (see chart 4). On Brexit, we are all passengers to the deliberation of our 635 increasingly divided and unstable MPs. Our core view is that that there are 3 options: a soft Brexit (a version of the deal on offer), no Brexit or exit without a deal. A soft Brexit looks most likely to us. Remaining would be – for UK focussed equities, our topic of conversation here! – very good news. We are therefore keeping our allocation to UK equities and we are optimistic about the longer term return prospects for them. The risk to our view (and our UK equity position) is therefore the no deal Brexit. We have to take this scenario seriously, not least because it is the default scenario if (as we find ourselves today) nobody can agree on anything. Should this come to pass, we think (as we have written before) sterling would fall sharply (as it did after the referendum). We are therefore looking, for our British pound denominated clients, to increase our non-sterling investments as a hedge against a (we hope unlikely) collapse in the pound. For our non-sterling clients, we will, where we can, look to limit our direct GBP exposure. Other than that, we would emphasise, as we have done before, that the UK is under 4% of global GDP these days. It is what happens with the remaining 96% of the global economy (and particularly the two largest players the US and China) that will drive returns for 2019 and beyond. We build globally focussed investment portfolios for this reason and ultimately we think this is the best protection against whatever our elected officials in Westminster throw our way in the next few months. Our investment approach is therefore built around diversification. We have four broad groups of assets (equities, bonds, absolute return strategies and alternatives such as property and infrastructure) rather than the more traditional two (equities and bonds). The idea is that four independent sources of return will give a smoother journey for our clients than relying on just two (particularly in rising interest rate environments). We have already talked about equity market performance and opportunities above. As for fixed income, the major government bond markets were broadly flat for the year. Normally, we would expect government bonds to provide some protection against falling equity markets and in Q4, when most of the damage was done, this was indeed the case. However, for the rest of the year rising rates in the US and the expectation that QE might finally be unwound in Europe meant interest rates drifted higher and so bond prices fell. We remain convinced that (as we saw in Q4) slowing economies will see interest rates fall (as central banks adjust to the slow down) and so bonds will add some protection for client portfolios. However, bond yields are starting from exceptionally low levels so the amount of protection they might be expected to provide is more limited than in the past. This is one of the reasons we also focus on absolute return and alternatives (meaning, for us, property and infrastructure). Here, the story was mixed. Property and infrastructure gained for the year which was pleasing in a market where most other assets fell. They also showed the defensive, diversifying qualities we hoped they would when we purchased them. Absolute return, however, struggled. Part of the reason for this was when markets reversed sharply in Q4 many of our trend following strategies (naturally and unavoidably) lost money as the trend reversed. 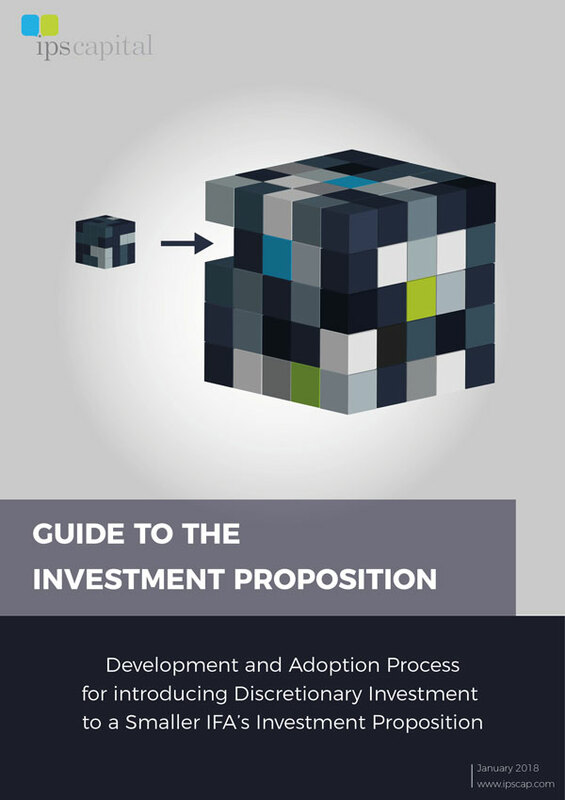 Also, a number of our absolute return strategies are built on the assumption that value (i.e. 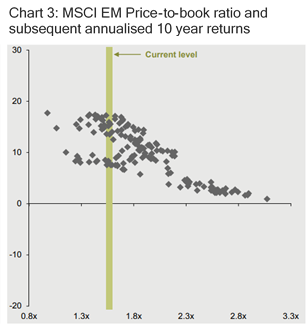 cheap) equities should out-perform in the long run. 2018 was, however, a year when cheap things just got cheaper. That said, in what was the toughest month of the year, December, our absolute return strategies did make a healthy return. The reversal in trend (from up to down) had already happened in October and as the sell-off accelerated our trend followers started to benefit instead from falling markets. December also saw some of the hottest parts of the market (such as US technology stocks) be hit particularly hard. This helped cheaper value sectors out-perform hotter more growth focussed ones. Both these factors helped our absolute return strategies make money. More importantly, if the current downturn does continue we would expect these tailwinds to remain in place for our investments. This should help absolute return continue to be a useful source of return in difficult times, which is of course their targeted role for our portfolios. Based mainly on technical, market-focussed indicators we cut risk in mid-December which means we have cash to profit from the opportunities that a sell-off creates, some of which we have already discussed above. How fast we will deploy this cash will depend on how the current slowdown in the global economy plays out. Chart 4 shows global leading indicators. You can see the last slowdown was in 2015 which bottomed out materially below where we are today but without a recession in any of the major economies. Should that story play out again in 2019 we would be optimistic for this year’s returns and we would look for a bounce in unloved areas such as emerging markets and (Brexit willing of course) UK equities. If we are wrong and this slowdown does accelerate into a recession then bonds look the safest place to be and we would look to add to our holdings. For those of you who think interest rates cannot go much lower than today, we would point to Japan (where 10 year interest rates remain anchored at zero) and the Eurozone (where short term interest rates remain negative even as unemployment rates approach cycle lows). This makes US treasuries yielding north of 2.5% look particularly attractive. Even UK 10 year government bonds yielding 1.3% today would make a gain of more than 10% if interest rates here converged to those found in the Eurozone. The wildcard for our UK based clients is, of course, Brexit. Here we continue to think a soft Brexit (i.e. a version of the current plan) or no Brexit look more likely than leaving in March without a deal. However, as we wrote above, if there is no deal then sterling would fall so we are adding to our non-sterling positions for our sterling clients. We also think (again, as happened after the referendum) UK interest rates would fall to cushion the blow so our UK government bonds would be a good source of return. As ever, if our thinking changes, we will look to update you. Apart from that, we remain focussed today on the opportunities ahead. We have the cash and the flexibility to exploit them as and when they arise and we are cautiously optimistic 2019 may prove to be a better one than 2018.